Welcome to our blog, covering a range of topics relating to art AND SOCIAL JUSTICE. If you'd like to submit a guest post, please contact us. we would love to hear from you. There are just a few more days to check out the solo show of French artist JR at Perrotin Gallery in the Lower East Side (NYC)! The two-floor exhibition is closing this Friday, August 17. JR, a French artist, applies the wheat pasting street art technique to massive printed photographs, pasting them on public locations like walls, bridges and rooftops. Having risen to international acclaim when he won the coveted TED Prize for his socially active art in 2011, his projects often have a social justice intention. At Perrotin, the issue of immigration is a major focus of the exhibition. Photographs, as well as a short film, are included that were taken of his project on the U.S.-Mexico border in 2017. JR constructed a billboard-sized portrait of a baby boy, Pedro, peering over the American border from Mexico (see photos below). On the final day of the installation, JR threw a picnic on an extended tablecloth printed with his signature eyes that traversed both sides of the border (one eye on the Mexico side, the other eye on the U.S. side) to symbolize that the world was watching. People on both sides of the border shared a meal together. For more information, check out the press release and exhibition write-up. Photograph at Perrotin Gallery (NYC) of JR's installation at the U.S.-Mexico border in 2017. People from Mexico and the U.S. share a meal at the border. 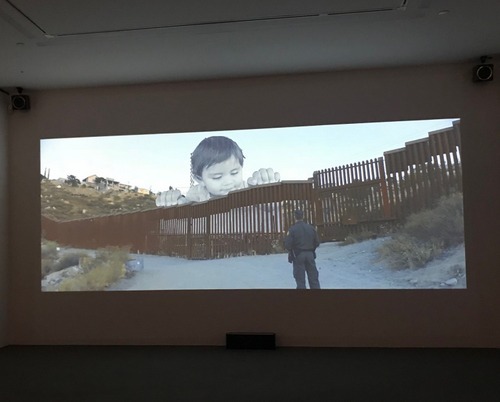 Photograph captured of a short film at Perrotin Gallery (NYC) about JR's installation at the U.S.-Mexico border in 2017. A baby boy peers over the American border from Mexico. Thank you for visiting us at FAD Market! Join Us at FAD Market December 15-16!